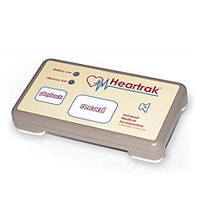 The Heartrak is a hand-held cardiac event monitor that requires no electrode patches. At the onset of symptoms, the patient places the four silver pads on the back of the monitor to their chest. Once the monitor is in position, the patient presses the Record button. To transmit the stored event, the patient must call the First-Call Medical Receiving Center at: 1-800-274-5399. The Receiving Center is open 24-hours a day, 365 days a year. The Heartrak is placed over the mouthpiece of the phone to transmit the stored EKG for analysis.